Eternally-Fresh Berries and Greek Yogurt. Convinced? Because I love this stuff berry much. Now orange you laughing at my fruit jokes? 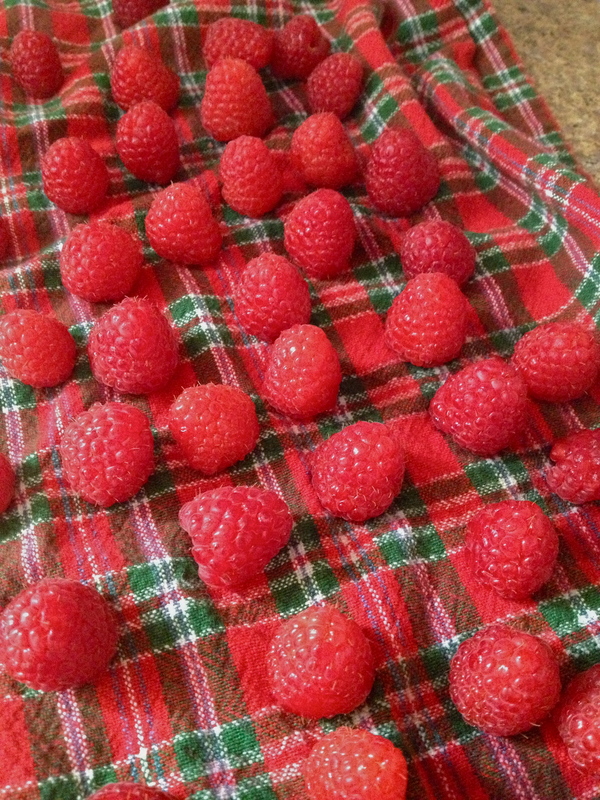 As soon as you get home with your berries, rinse them under cold water. 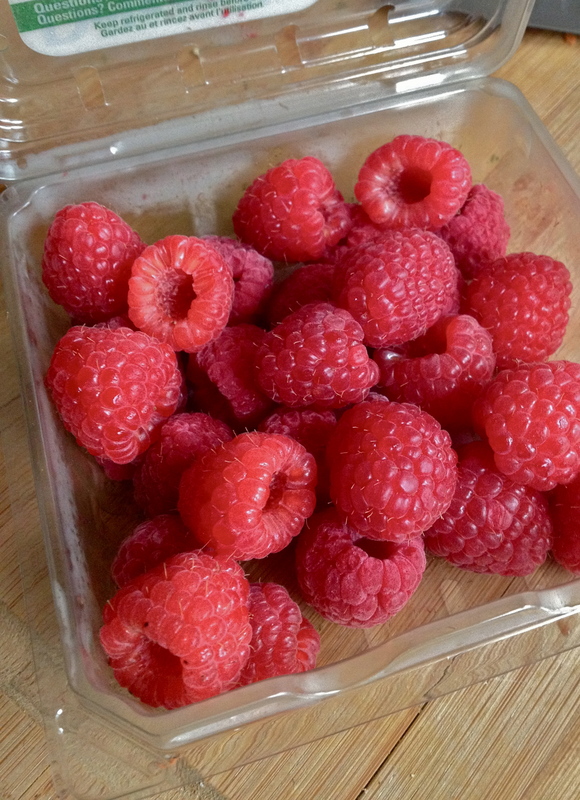 Then turn them out onto a towel and flip each one upside-down; if you’re using raspberries, for example, turn them so that they’re standing up on their hollow end. This helps them dry completely, which is what we’re going for. Leave the berries for an hour or two, until dry. When the berries are dry, put them back in their little plastic basket or other similar container (which should also be dry). Put one of the containers in the fridge and use within 2-3 days. Not only can you eat these on the go, without stopping to rinse them and then have them wet and drippy, but they also last a lot longer when they’ve gotten a chance to dry before they get piled on top of each other in the fridge. 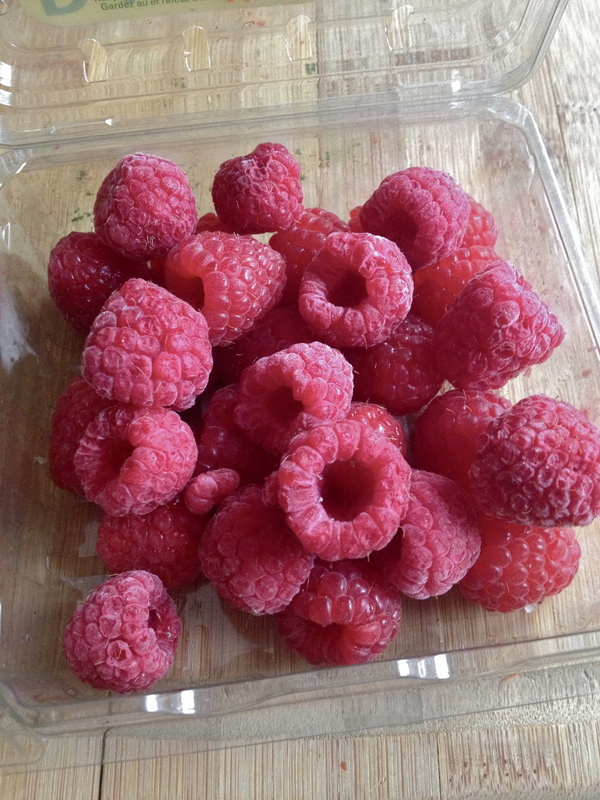 Put the other container of berries in the freezer. Because they are dry, the berries will freeze individually, without sticking to one another, and they’ll keep their perfect picturesque berry shape. 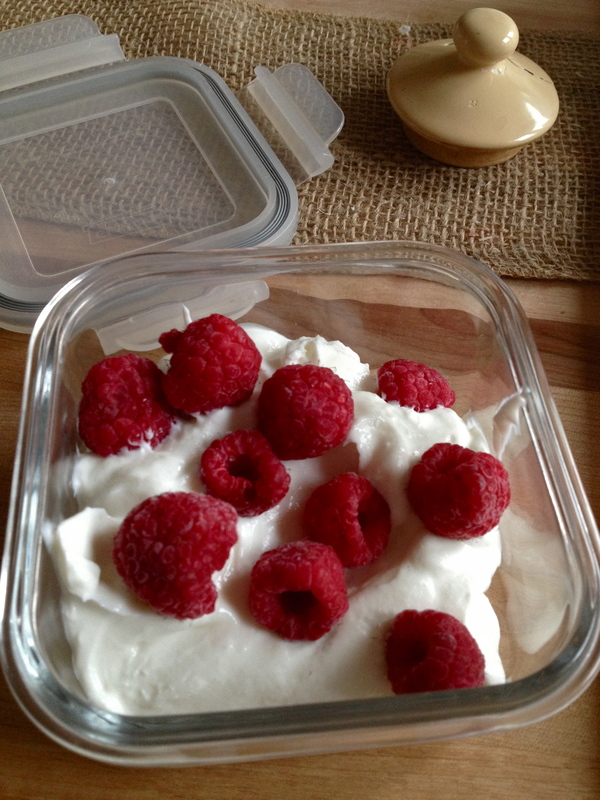 Here’s how I use the frozen berries: before I leave for work, I spoon a portion of Fage Greek yogurt into a tupperware and toss in 8 or so of these frozen gems. By the time I get to work and dig into the yogurt, the berries have defrosted and gone a little bit soft. 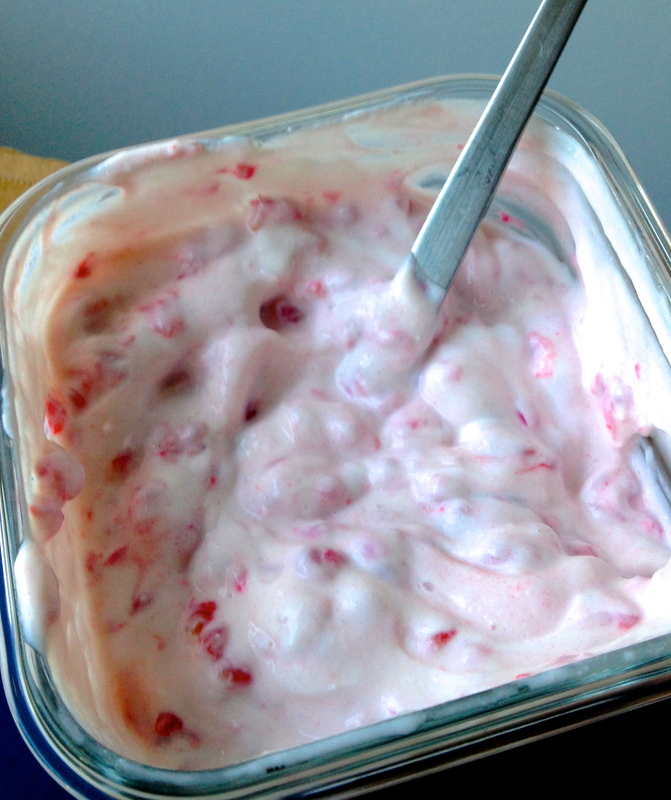 They’re the perfect consistency to crush up with my spoon and stir into the creamy yogurt. I LOVE this because it’s just as delicious as one of those yogurt-and-fruit single serving cups, but it’s so pure and healthy! Here’s what it looks like once I get it to the office and stir everything up. Best easy workday breakfast ever! 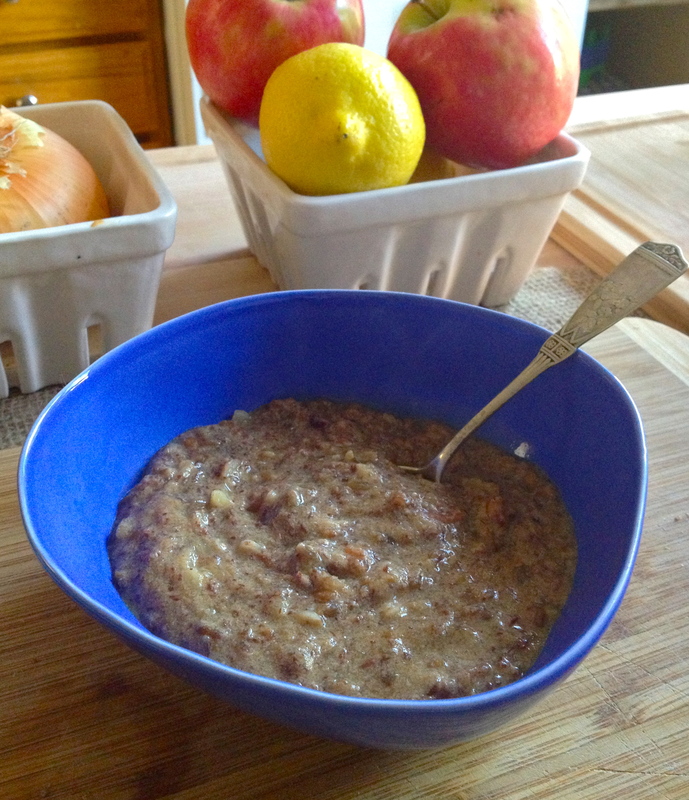 Cream of No-Wheat: a hot cereal made with nuts, dried fruit, seeds, and cinnamon – but with no wheat and no oats. Considering how I’ve altered the way I eat pretty dramatically over the past few months, moving away from processed grains and sugar and toward protein, fruits, veggies, and the like, this recipe is the answer to my breakfast dreams! That’s because, while I really haven’t looked back following these big changes, I have to admit that there are a few things I have truly, truly missed, and one of those things is my morning oatmeal. When I saw a recipe from A Girl Worth Saving via salixisme that looked like a great hot cereal compromise, I had to give it a try. And it is absolutely delicious: creamy, nutty, with just enough sweetness from the dates, and a slightly chewier consistency from the nuts and seeds. It’s a very flexible recipe, and you can swap various ingredients in or out as you like: pumpkin seeds, wheat germ, pecans, dried apples, or brown sugar would all do a little something special if you wanted to try them out in here. 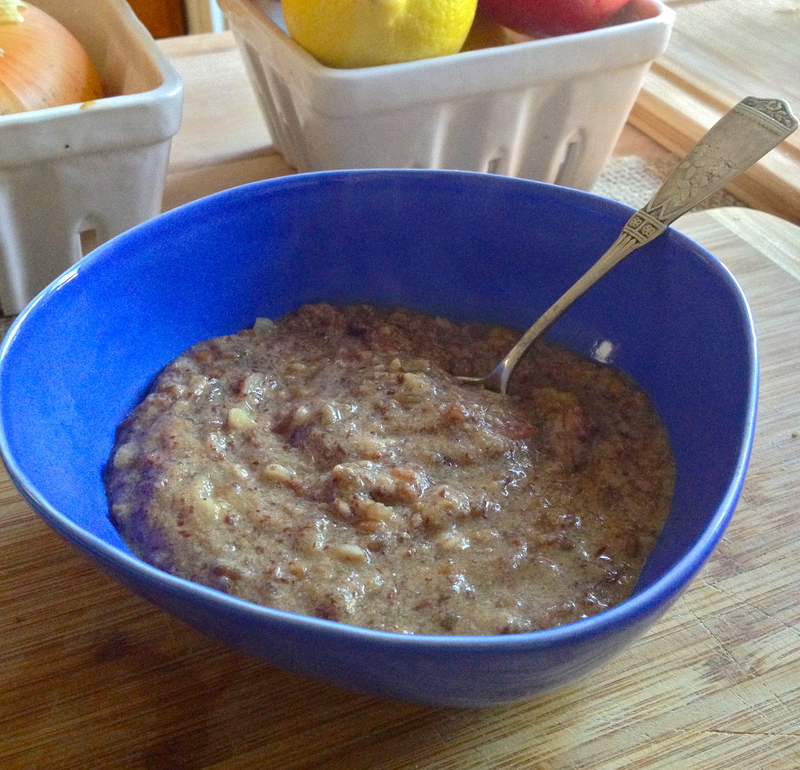 And because this recipe makes about 8 servings, you can prep the “oatmeal” dry mix ahead of time, and just cook however many servings you need that morning. 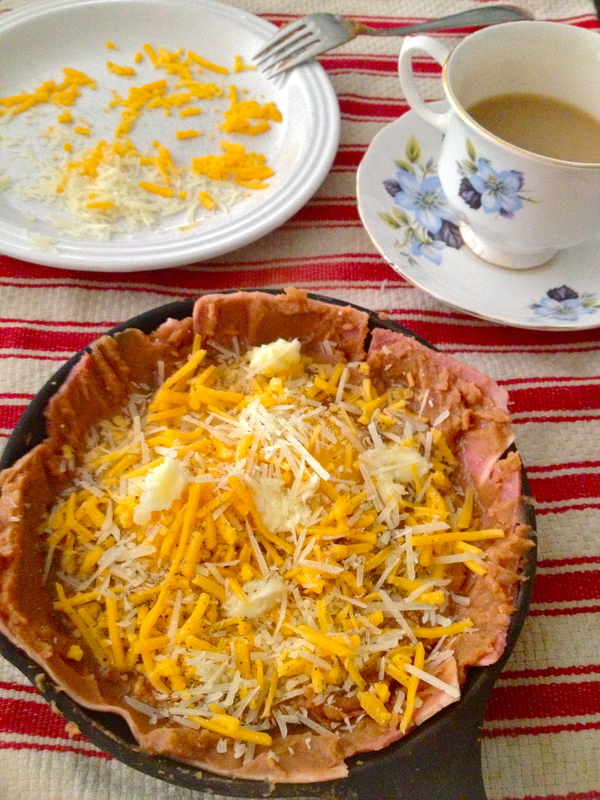 I calculated it out, just to see what this dish looks like from a protein perspective: each 3/4 cup serving has about 8g of protein, plus about 10g from the milk, making this a breakfast with about 18g of protein. Yay for hot breakfast! 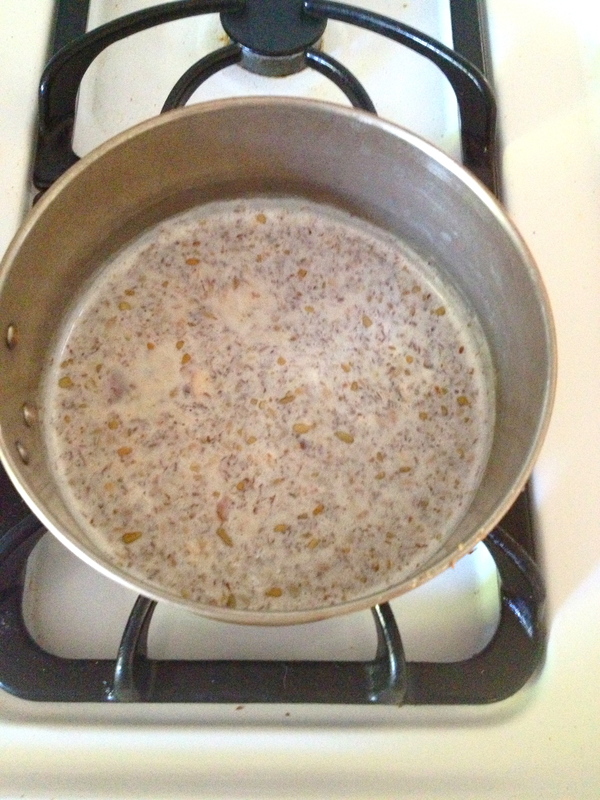 UPDATE: I recently made another version of this – I was out of sunflower seeds, so instead of the 1/2 cup of sunflower seeds, I used about 3 tbsp of chia seeds and an additional 1/4 cup of chopped walnuts. The chia seeds were awesome here, thickening the consistency to that it more closely resembled cream of wheat. I’m definitely adding chia seeds to this every time I make it from now on! *NOTE: chop your ingredients finer if you want a smoother, more cream-of-wheat-esque finished product, or leave them bigger for a chunkier consistency. I tried to opt for a middle ground. 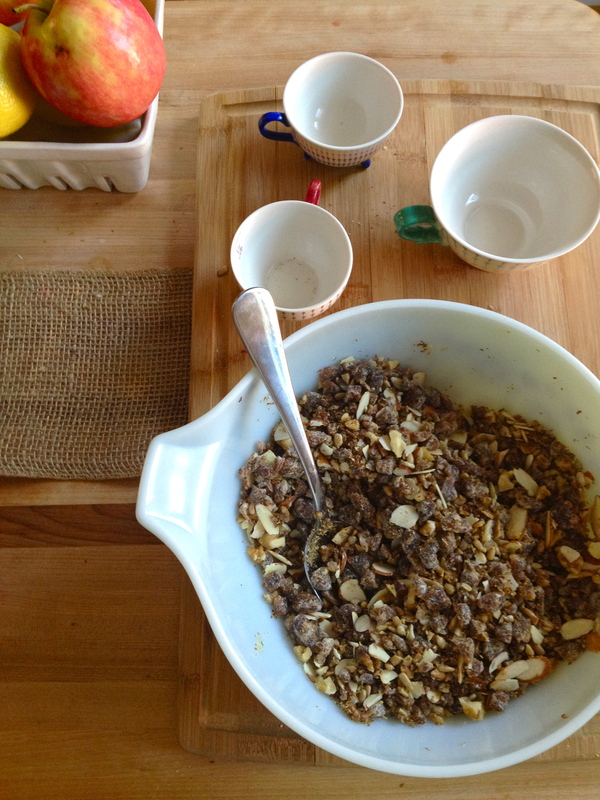 Combine all the dry mix ingredients in a bowl and stir together. Measure out the amount you’d like to make now (about 3/4 cups per person should do it), and store the rest in an air-tight container in the fridge, for future use. 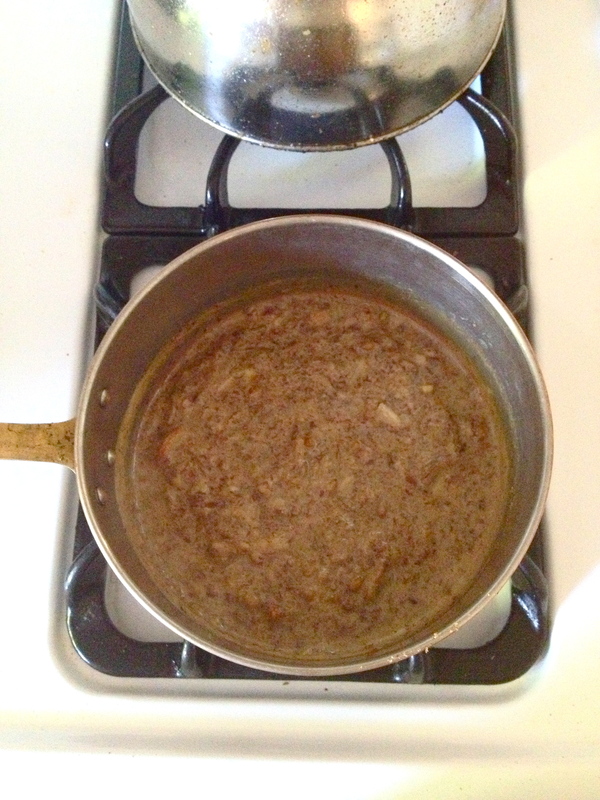 To cook the oatmeal, bring the milk to a gentle bubble on the stove and stir in the dry mix. Stirring occasionally, simmer gently until thickened to your liking (mine took about 10 minutes, give or take). Remove from heat. 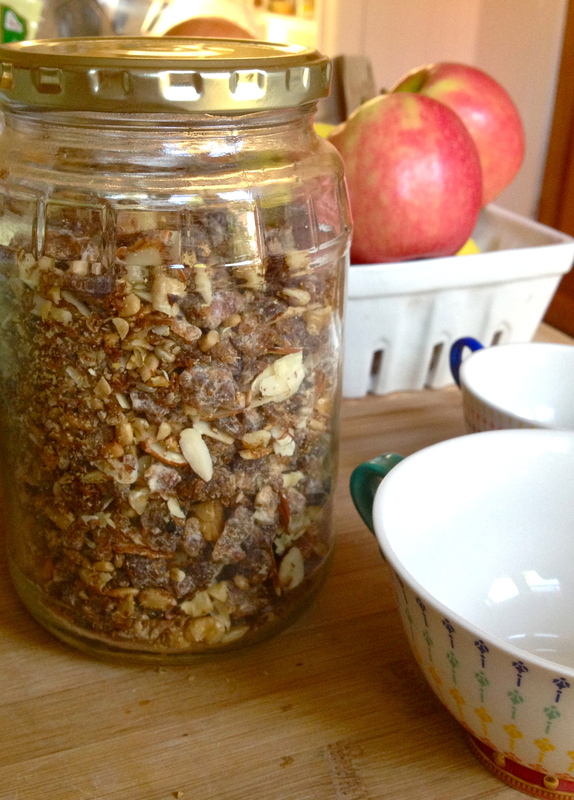 Spoon the good stuff into a bowl and stir in any extras you like – more milk, fruit, nuts, whatever! Then dig in. 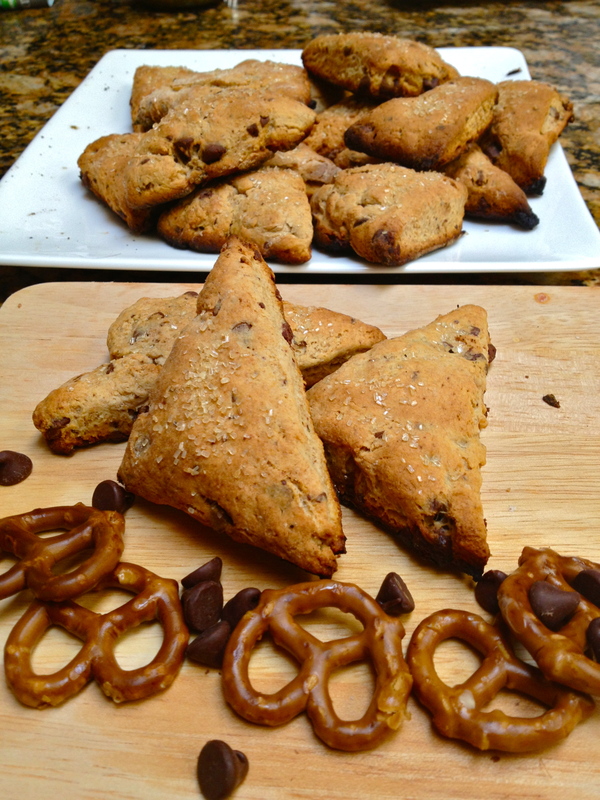 Pretzel Milk and Chocolate Chip Scones. On a cute and crazy-creative blog called “A Cozy Kitchen, ” I saw blogger/pancake expert Adrianna do something magical: she made pretzel milk pancakes. This is one of the most food-genius things I’ve seen in a long time: she roasted pretzels in the oven, soaked them in milk, and then strained them out so that the milk was left in faintly golden pretzel-flavored perfection, making her pancakes deliciously pretzely. 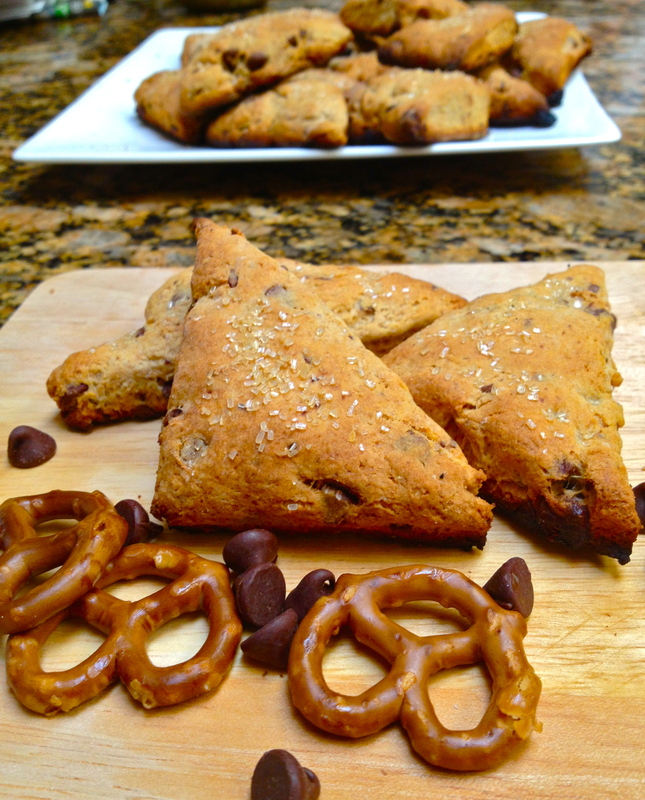 I was mesmerized by this idea, and initially wanted to make a cookie using the pretzel milk method. 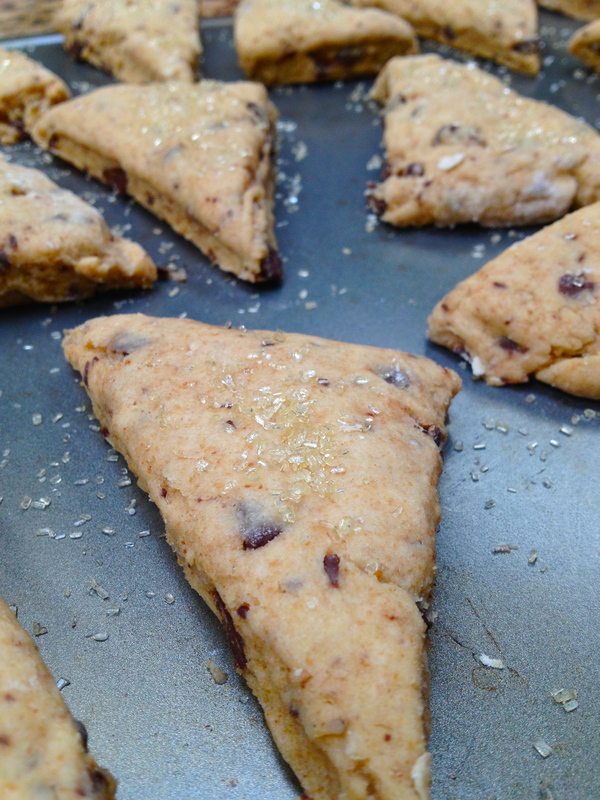 I’m still working on the cookie version of this recipe, but for now, these scones are pretty amazing. Pretzel milk – I am so glad we’ve found each other. The lightly golden milk gives the finished product the most unusual and profound savoriness—not in-your-face pretzely, but more of a welcome note of something warm and deep. It’s pretty special. I have a question for my beloved readers: what to do with the milk-steeped pretzels you’re left with after making the pretzel milk? I ate a few (they’re actually good, in a weird, slightly soggy kind of way), but there’s got to be something interesting they could be used for. Crush them up and stir them into muffin batter, or even cookie dough? Or food-processer them with lots butter and maple syrup, shape the butter mixture into a log, toss it in the fridge, and a few hours later you’ve got maitre d’ maple pretzel butter for toast and waffles and all those goodies? If you come up with a good use for them, let me know! And PS – when they’re in the oven, watch these more carefully than I did….my scones got a little bit toastier than I would have liked. Still awesome though! Preheat oven to 350 F. Spread pretzels onto a sheet pan in a single layer and roast until they turn a nice dark brown, about 10 minutes. Let them cool completely (don’t worry, they cool very quickly). 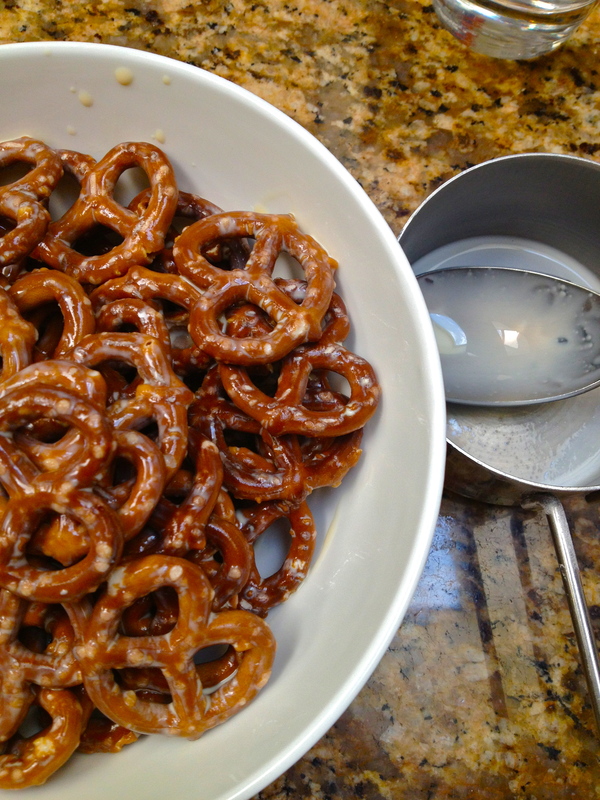 Transfer the cooled pretzels to the cream or half-and-half and let them soak for about 15 minutes. Then strain, leaving just the beautiful pretzel-y cream. The pretzels will have soaked up some of the liquid; you’ll need just 1 cup total for this recipe. If you have any leftover milk, keep it on hand and maybe dip the scones into it once they’re baked. This stuff is amazing. 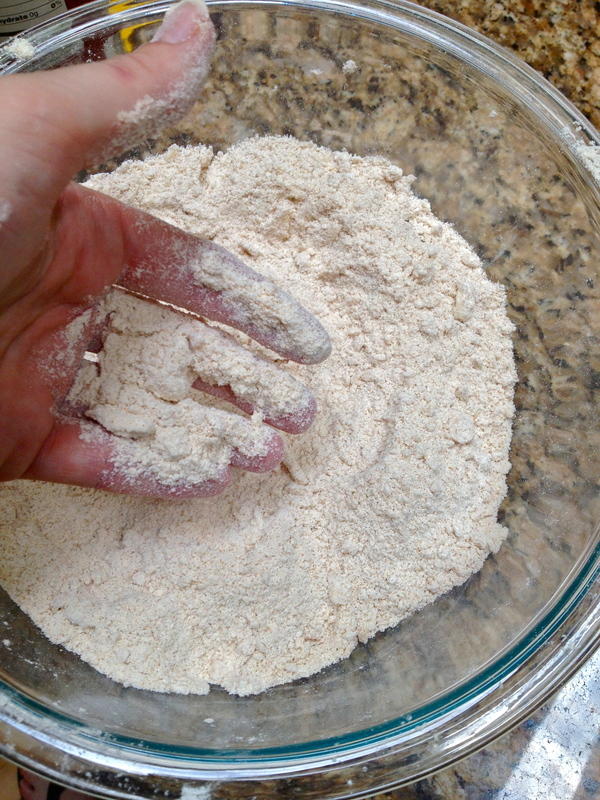 Place flour, baking powder, sugar, and salt in a mixing bowl or food processor. Whisk or pulse together until combined. Add the butter; if using your fingers, quickly rub the flour mixture into the butter until the mixture resembles coarse sand, handling the butter as little as possible and careful not to melt it as you go. 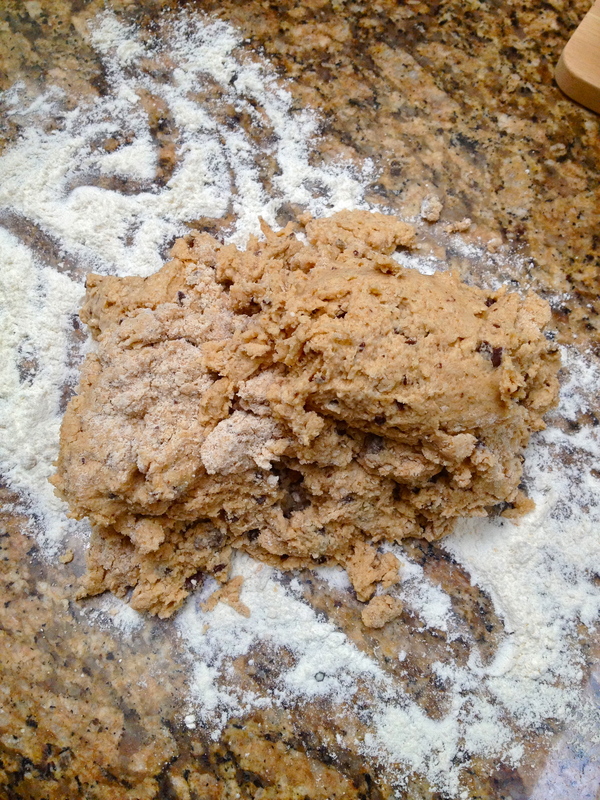 If you’re using a food processor, pulse together until the mixture resembles coarse sand. Add the chocolate bits and stir or pulse briefly to combine. Transfer mixture to a mixing bowl if it was in a food processor. Stir in the pretzel milk until the dough starts to come together. Then turn it out onto a floured workspace. Knead the dough a few times gently with your hands, just until it comes together in a ball – the less you work the dough, the better, since you don’t want the heat of your hands to melt the butter. 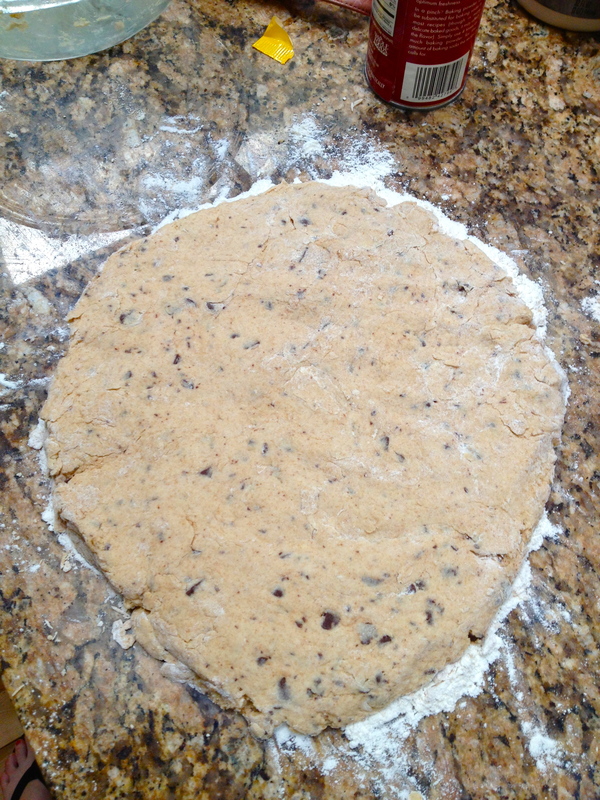 Flatten the dough into the shape of a rectangle (roughly…. ), about 3/4 inch -thick. Okay fine, so this dough is obviously not in a rectangle. 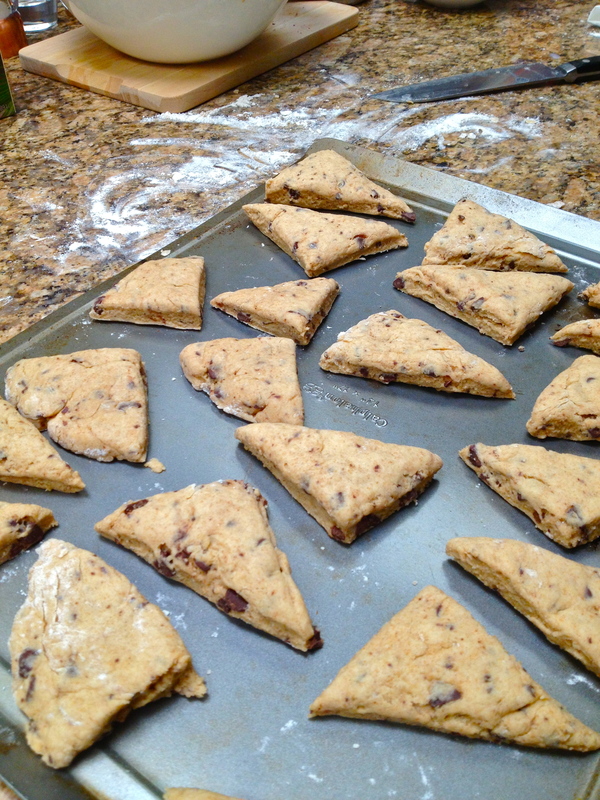 I took this picture before I decided what shape I wanted the scones to be. Whatever. Cut the dough into squares. Then cut each square diagonally in half, to make little triangles…..Or, cut them however you want! If you like, sprinkle each scone with a bit of turbinado sugar. It’s sweet and gives the scones a little bit of crunch. And it’s pretty. Place sconces on a baking sheet and bake until light brown, about 12-15 minutes. Cool slightly before serving. These more than rock with sweet cream butter and a cup of black tea. 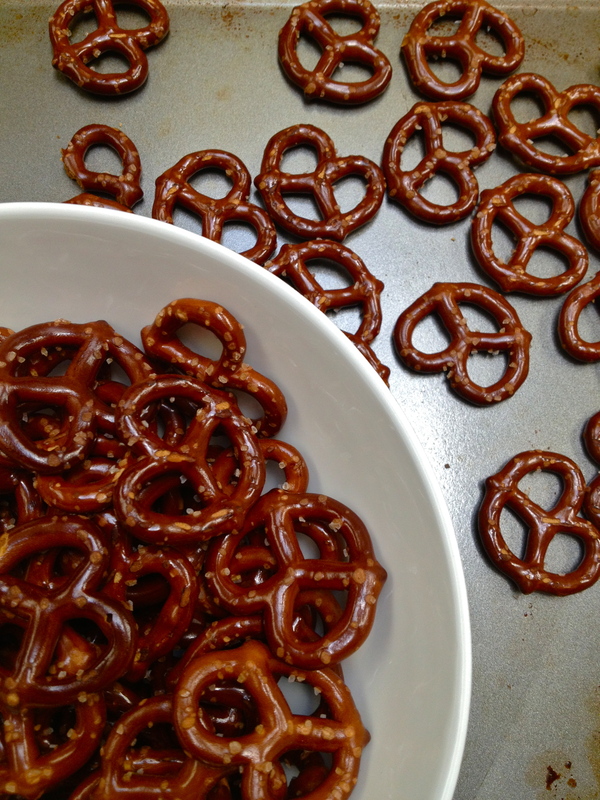 And seriously – any ideas what to do with these already-steeped pretzels?? Bacon, Bean, and Egg Skillet. 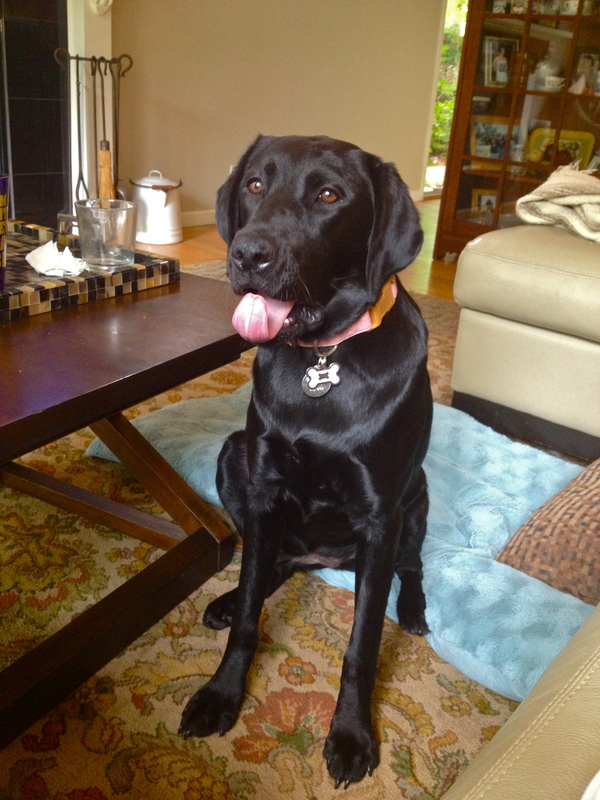 I’ve mentioned before that I’m eating a little bit differently now than I have in the past. One of the big changes I’ve made is cutting way down on grains and sugars, and completely eliminating them at breakfast time. 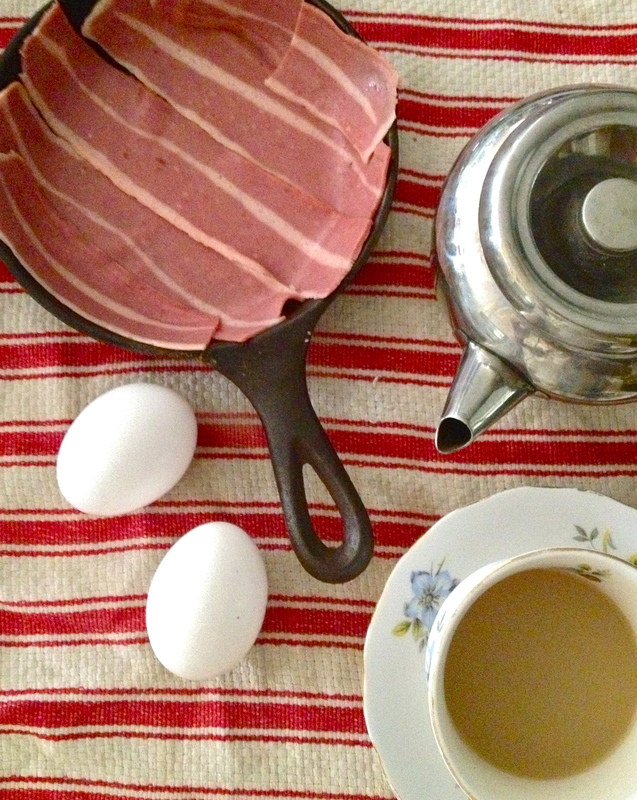 It’s been kind of hard, given that a lot of the most delicious breakfasts in the world involve both of these things. So I’ve had to get a little bit creative, especially when I’m in the mood for something more dramatic than simple eggs or yogurt. That’s what this is. 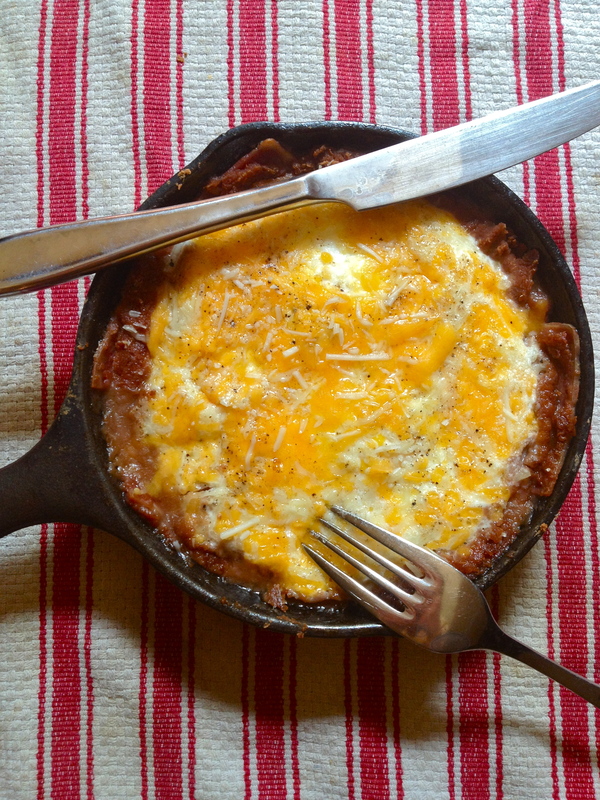 I don’t really have a story for this bacon, bean, and egg skillet, other than that it was delicious. I had been craving a recipe from Rachel Khoo that is similar but involves béchamel sauce and white bread, so I altered it a bit and created this dish. Yum. And if you’re making this, please see my note about bacon – it definitely makes an improvement on my original recipe. Cook your bacon about 50% of the way. Then lay your pre-cooked bacon in the bottom of the pan, forming a base for the beans. Watch out for little bacon-lovers, who may be drawn to you at this point. Spread the beans in a smooth layer all over the bacon, a little higher toward the sides of the pan and a little shallower in the center, where the eggs will go. 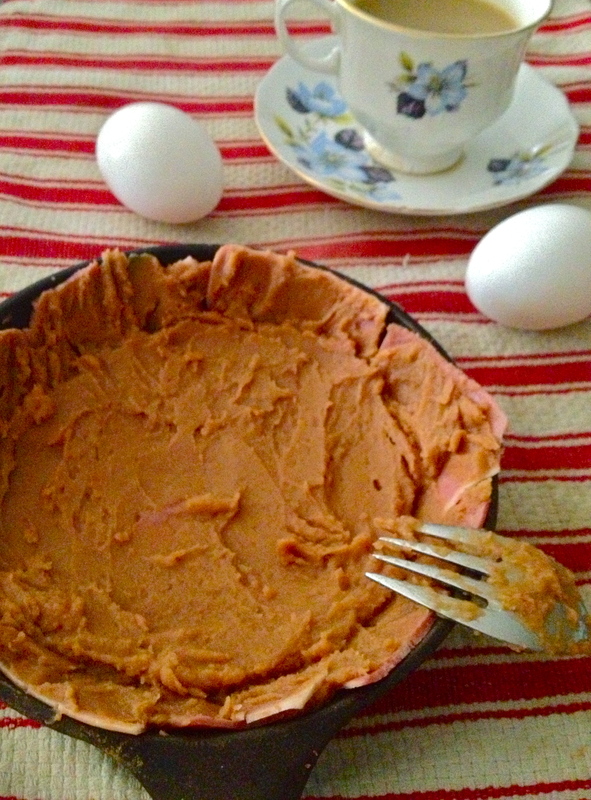 Crack the eggs into the center of the dish. Sprinkle with salt, pepper, and cheese. Bake until the eggs are set but the yolks are still runny. Watch them carefully so as not to overcook. 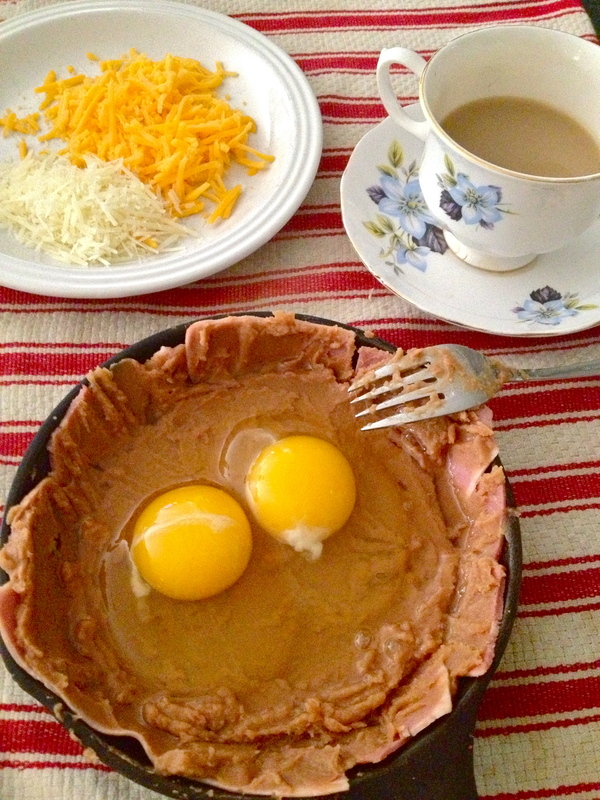 Be sure to cut right into those yolks and let them run all over. Oh yeah. 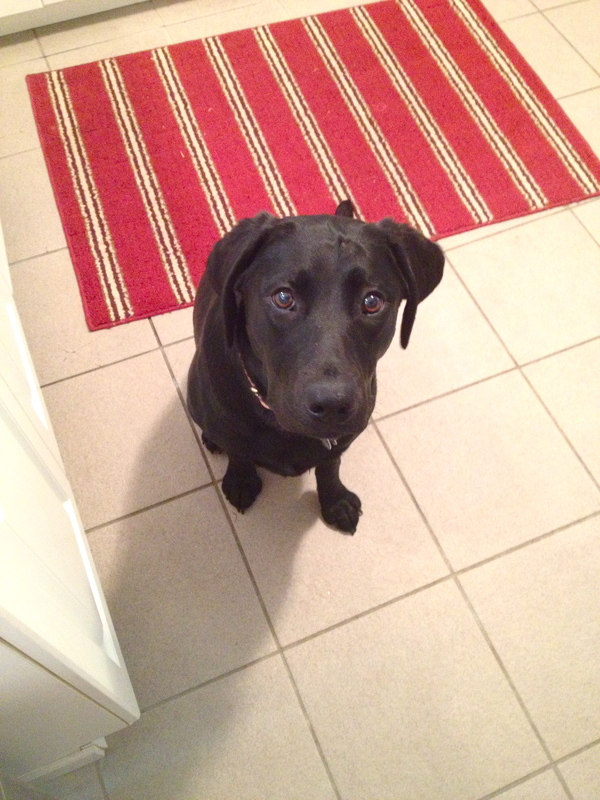 And watch out, in case the little bacon-lover returns to beg.